The WORCESTER PARK Blog :: A Streetcar named desire? I’m quite glad that Worcester Park doesn’t have any petrol stations. They depress me too much. With the price of fuel creeping ever skyward each foray onto the forecourt sees me leaving £60 lighter and so miserable that no amount of their overpriced ‘woops-I-forgot-the-wife’s-birthday-again’ flowers could cheer me up. It’s not just the price of fuel that hits motorists hard these days - add up the cost of road tax, depreciation, insurance, MOT, repairs and servicing and the average cost for maintaining a car and using it for just two journeys a week stands (according to the AA) at an eye-watering £2,700 per year. It’s small wonder, then, that car clubs are proving an increasingly popular and cheap alternative to car ownership for those who only need use of a vehicle once or twice a week. The concept is simple - sign up to a car club and as a member you can pay by can book a car near you for as little as an hour at a time. 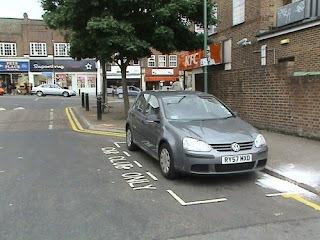 The car club phenomenon has now arrived in Worcester Park courtesy of the UK’s largest car club company ‘Streetcar’. They have three cars in the local area - one in Caldbeck Avenue (near KFC) and the two in Beaumount Avenue in The Hamptons. As a car club member you simply book the car online (or over the phone) find the car in its allocated parking bay, swipe your smartcard against the windscreen to unlock the vehicle and off you go!